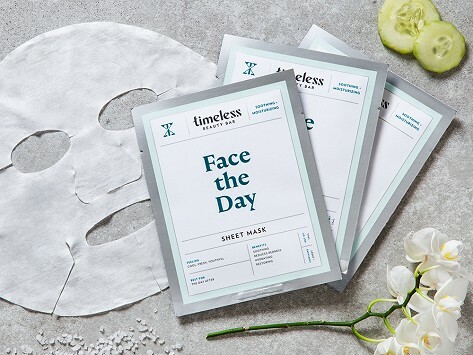 Perfectly packaged travel face masks make it easy to enjoy a treat-yourself moment. Made in the USA with pure cotton sheets and ingredients picked to target what your skin needs, like Vitamin C to brighten, oat extract and cucumber to combat puffiness, and red wine and hyaluronic acid to refresh. An on-the-go beauty solution that’s also a fun addition to a night in. Dimensions: 6" x 4.72" x 0.5"
Timeless Beauty Bar Maker Sandhya Lakhani was looking to streamline her beauty routine (and all the products) when she traveled. This led to an obsession with sheet masks. So she decided to make her own—Made in the USA with pure cotton sheets. Putting one on is a treat-yourself moment you can experience just about anywhere. Ingredients like vitamin C, rose, hyaluronic acid, oat extract, and red wine (yes, red wine) work like a serum to brighten, soothe, and rejuvenate skin, depending on what you need. If you feel like a little cool-down, you can pop a mask in the fridge before putting it on. It’s equal parts an on-the-go beauty solution and a fun, night-in activity. Go on, treat yourself.